Home / Food Prep / Fruit, Vegetable and Salad Preparation / Fruit and Vegetable Cutters / Dynamic CL006 / ZCUBE DynaCube Vegetable Dicer / Cuber, 3/8"
The Dynamic CL006 / ZCUBE DynaCube Vegetable Dicer / Cuber is the perfect manual vegetable cutter tool for quality and precise cutting. It is simple and practical to use for dicing vegetables rapidly and efficiently. A safe patented grid system made with surgical stainless steel blades ensures a clean and consistent cut of vegetables, fruits and cooked meats. 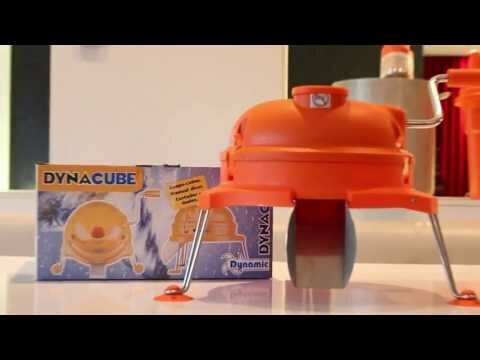 The DynaCube is also great for soft vegetables and maintains a high standard of hygiene as food is never in contact with the user"s hands. This versatile vegetable dicer has two fastening systems, anchor pads and suction pads, for adapting perfectly to the work surface and can be easily transported and stored away thanks to its foldable legs. Comes with the red (10 mm x 10 mm) grid cutter for 3/8 inch pieces. This product measures at 13 inches high with a 15.75 inch diameter.